Our daughter Alex was born on Saturday, June 19, 1993, she joined 15 month old Courtney. Her brother Tom, our third and final child, arrived 2 ½ years later. Although we did not realize it until after her birth, Alex has Down syndrome. These past 17 years have been an unexpected, but beautiful journey. But as with many unplanned journeys; stages must be travelled before acceptance of this different voyage is embraced. I would like to share our experience in the hopes our travels can help other families with children with Down syndrome. Before I start to explain our journey, I’d like to share a little about Alex and her birth. When Alex was born her umbilical cord was wrapped around her neck and she was blue. Her apgar scores were low, so after a brief introduction she was taken to the neo-natal intensive care unit at the hospital. The doctor assured us Alex would be fine, however, when I asked the nurse if there was something wrong she hesitated before trying to comfort us. To this day I believe when Alex was delivered the nurse recognized right away Alex had down syndrome; the doctor did not. The doctor had read my chart and saw the results of the prenatal tests I had taken suggesting we were having a "normal" baby. I now know that "normal" is an extremely, misused and incorrectly defined word when used in conjunction with babies and children. I was 34 when I delivered Courtney, and although Alex is only 15 months younger, I was in the "risky" age area and the doctor suggested I undergo genetic testing. I agreed to the CVS test which can be done very early in the pregnancy. In this test, a needle is unceremoniously placed in a very uncomfortable part of one's anatomy in search of fetal cells. By culturing these cells the geneticists are able to count the baby's chromosomes, as well as look for other genetic markers. I am not sure of the failure rate but it is at least one in 10,000; I was the one. Next, the Doctor suggested I do an amnio; this is done later in the pregnancy when you can feel the baby alive and kicking in your womb. As a needle was unceremoniously being inserted in my abdomen I mentioned to the Doctor that I was on the way to the airport. He pulled the needle and refused to do the test. Apparently, the hole that would be created in the amniotic sac has a greater chance of rupturing in the low pressure of an airplane. Instead he did a full ultra sound and declared everything to be perfect, again a misused and incorrectly defined word when used in conjunction with babies and children. As soon as possible after the delivery ,my husband John, helped me gather myself together and shuffle down to the NICU (for those of you that have given birth, shuffle is the correct term). I had a knot in my stomach but did not want to alarm John. I asked to see the doctor and what blurted out of my mouth surprised even me. I asked "Do you suspect down syndrome?" and the reply was a simple "maybe, we need to do a blood test and the results take three days". The results came back positive for down syndrome, and our new and unexpected journey began. I, we, were given the opportunity, and not through my own actions, to not have to make a decision that I would regret for the rest of my life. By having two "failed" prenatal tests I was never asked if I wanted to terminate my pregnancy. I never had to call my family and ask for advice over an early termination, and I never had to make a decision that would have prevented me from having Alex. Many, many, women are faced with information that affects their pregnancies every day. I do not condone or condemn any single person's decision relative to their own lives. I just know I am glad I never had to make that decision. Our family, our friends, and the world would have possibly missed not meeting Alex; she has changed us all. I am often told I am a great mom because I have a child with down syndrome. This is not the case at all. 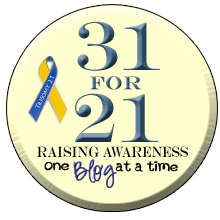 I am just like any other mom of three kids, only one of my children happens to have down syndrome. I do agree our life is a bit different than other families with three children. 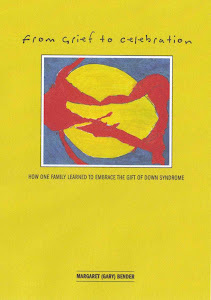 We grew in a way I had never imagined; down syndrome has enriched our lives and those of our family and friends. We learned to accept and embrace down syndrome Yes, we are different, but yet we are still the same. I call our journey the 10 verbs (and one bonus verb). In the next pages I will share these verbs and how we have used them. They are in a very basic order. The first four were mine and John’s; the next six belong to all of us. And the bonus verb is Celebrate. I hope you enjoy our passage. Those verbs are perfect. Alex is perfectly Alex and glad to have the honor! Thank you for sharing this Gary. Very well written and heartfelt.